The Sun is a typical yellow main sequence star - its mass, size, surface temperature and chemical composition lie roughly midway between the extremes exhibited by other stars. Even though it is the closest star to our planet, its light still takes 8.3 minutes to travel the roughly 93 million miles between the sun and the earth. 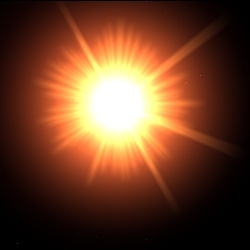 The Sun, the giver of life, plays an important role in the ancient civilisations. Many of the worlds primitive people's regarded the sun as a deity, the Assyrian and Babylonian sun god was called Shamash, known as Mithras to the Persians, Ra to the Egyptians, to the Aztecs he was known as Tezcatlipoca, the 'smoking mirror', as Helios to the Greeks, and the Romans as Sol and usually identified with Phoebus and Apollo. The Mayans were extremely accomplished at making solar observations. At Chichen Itza, during sunset a sun serpent rises up the side of the stairway of the pyramid called El Castillo on the day of Spring and Autumn Equinox. They also noted its extremes at the solstices and spent large amounts of time making ecliptic observations. Is a period of 28 years, at the end of which the days of the month fall on the same days of the week as they did 28 years previously. The Sun's astrological house Leo, and he represents the vitality, general health, and life force; the conscious identity and ego, the public life, those in authority, and men in general. It is the “who” you are at the very core of your being. It is the True Self, without doubts, without fears, without boundaries. It also describes how you perceived and experienced your father or father-figure. The Sun is associated with the element of Air. In the physical body, the Sun rules the heart, upper back, spine, wrists, and inherited physical stamina. In colours, the Sun is associated with orange, bright yellow, and gold, the gemstones Carnelian, Citrine, Tiger's Eye, Amber, Quartz Crystal, Red Agate and the metal of gold. Of the herbs, the most common associations are, Marigold, Heliotrope, Sunflower, Buttercup. Of the trees the Sun is associated with Cedar, Beech and Oak. The Sun is the natural ruler of gold. In magical workings and rituals call upon the Sun for active change, advancement, creativity, ego, fame, favour, friendship, growth, healing, health, honour, hope, joy, leadership, life-energy, light, monetary gain, personal fulfilment, power, pride, promotion, self-confidence, success, superiors, vitality. In is negative aspect the Sun represents arrogance, bigotry and pride. 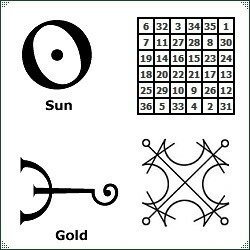 The table of Sun is a Six square, containing 36 numbers each adding in any direction, to 111 with its sum being 666.